Having received feedback for both the Drawing Brief and Warm up exercises, it was encouraging to read such a positive response, even though I hadn’t done any serious drawing (or mark making) for a very long time. I instinctively work in quite a reserved, clean and precise manner (thanks to being a graphic designer for so long) and I think this course will definitely push my boundaries in terms of exploration, expression and confidence building in the way I approach tasks and different media. So far, exercises from mark making, drawing with line and collage are making me work more boldly, the latter stages of collage I hope have become a real turn in the tide. I also tend to get hung up on finished results and as pointed out in the feedback, the process is there to explore, make mistakes and getting the control freak in me to relinquish control. A sketchbook for scribbles and notes proved to be quite pivotal during stages of Collage where I felt I needed to take a step back from the exercises. Sketching and scribbling took the pressure off producing a ‘finished’ piece of work. Although at this stage, I really do think that nothing is finished as such but goes on to feed future work. As Lizzy has written ‘…this can be used to inform more resolved work later’. Also picking up on ‘…experimenting with your own methods of working’. I found during the early stages of the Collage brief that I was almost forcing myself to work in a way that didn’t suit or work for me, particularly with paper choice; I felt I should be using patterned paper, envelope insides etc.. I looked at what inspires me, what type of work makes me think ‘wow’, collated and lodged these thoughts in my head and turned to methods that felt far more instinctive while still attempting to push my parameters! I have vast amounts of inspiration which at some point will be collated via a scrapbook (still digitally filed at the moment). This will help my critical and contextual thinking; I know when I like something, but why do I like it? I definitely need to ask and question myself more. Out and about, I visited Project 78 Gallery in St Leonards on Sea in December to see the exhibition ‘You can go anywhere from anywhere’ curated by Ismini Samanidou and Simon Barker and inspired by Ismini’s time at the Albers Foundation. I will keep referring to the feedback incorporating the advice and suggestions into my work and continue to experiment, question and explore the creative process. 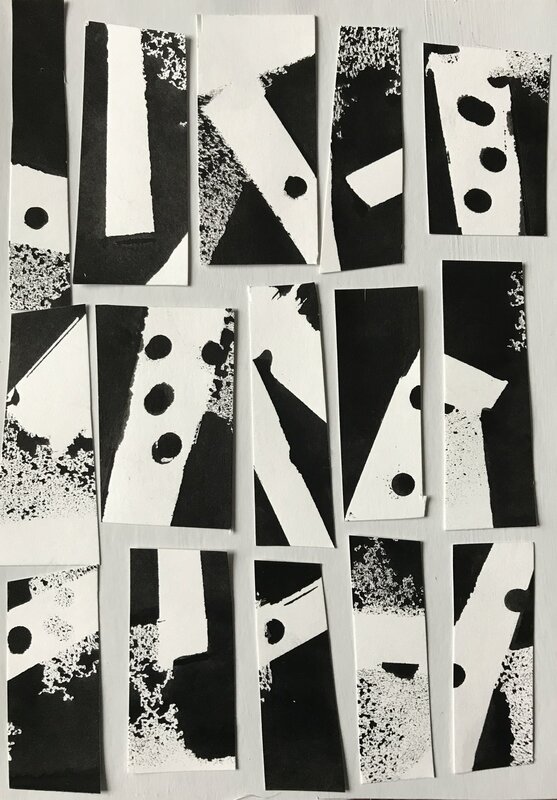 According to Matisse, collage is a means of ‘drawing with scissors’ and is achieved using an assemblage of plain or patterned paper and card, as well as text and photographs. Papers can provide a rich palette of colour, texture, pattern and imagery. The objective of this brief is to explore drawing, encouraging the use of collage to experiment with process and result through colour, form, line and tone using plain or patterned papers. 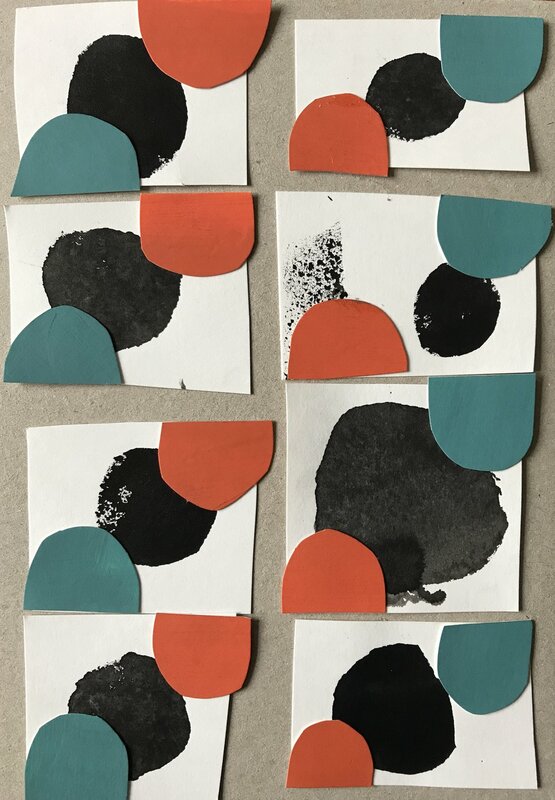 Even though it doesn’t involve the use of conventional drawing as in Brief Two, it still encourages creativity, observational skills, unusual colour and pattern combinations while reinforcing simple design ideas to trigger the creative process. I’ve never really used collage in my work so this brief was to prove interesting. The brief initially asks for research into artists who used collage in their work as well as collecting material for the forthcoming exercises. I found many sources of inspiration but chose these three artists. As I make my way through this course, I am constantly reminded of the way I work which isn’t always a positive! Naturally quite tidy, reserved, limited colour palette (my favourite colour is grey), not particularly daring or bold. At the beginning, I also had a preference for plain paper. Fortunately, this was set to change. I chose my objects. A kettle, a toaster, that Bialetti, an antique iron. Initially, I misunderstood this exercise and introduced line early on. I re-read the brief and re-observed the objects. The brief asked for multiple studies on an A2 sheet but I struggled to work that small due to paper thickness so I produced just one study per A3 sheet. I introduced negative space alongside using large blocks of colour. I thought I’d be brave and use the inside of an envelope! I felt both the colour and texture of the envelope really worked for the iron. But still, it felt too clean and literal. This exercise was about the creative use of line drawing in collage. I’ll admit at this point, I felt I was struggling with producing work that 1. was particularly creative, 2. I was pleased with. Cutting lines or stripes from plain paper was not inspiring me and I had to re-address how else I could interpret the brief. The plain paper was proving to feel limited yet I wasn’t being drawn to using pattern either. 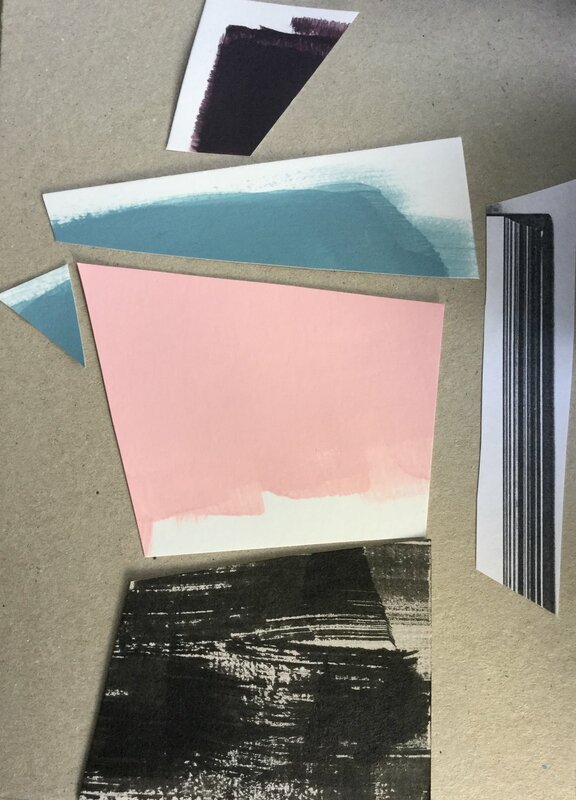 At this stage, I decided to create my own papers using pencil, oil pastel, Farrow and Ball paint and black ink, harking back to the happy days of mark making. As the Bialetti offered multiple challenges in itself, I continued to use this as my sole prop. Firstly, I tore and cut pieces of various papers with line and stripes to compose a Bialetti. The process felt a bit more interesting and a little freer but I still wasn’t overly satisfied with the end result. I then decided to simplify the paper selections as in Bialetti 1 and 2, opting for simple paint effects. Finally, I felt I was starting to make a little more headway. An old photocopy of a book’s pages became a good handle option. I experimented with different angles of the Bialetti but found I was endlessly aborting those attempts. I purposely kept the angles simple and continued with abstracting the shapes and elements. I then took a bit of a break from the collage making, found more sources of reference and inspiration and spent some really satisfying time creating more interesting marks using a combination of white and Kraft paper and thin card. I applied paint and ink with brushes and a foam roller and used masks made from paper to create stripes and spots (with help from a hole punch). The ink and paper masks worked really well due to the fluidity of the ink and the uneven texture of the foam roller. These new bases were beginning to form a good foundation for the next exercise. This exercise is about developing a series of repeat simple stripe or spot designs using the techniques discovered previously. I had recently purchased some A5 Kraft board and decided to use this. The plan was to produce small collages developing these into a final series. I started to look into other papers having felt uninspired by my paper samples for a while. It was evident in my research that I was immediately drawn to print (that could work as collage), even gleaning inspiration from quilting and surface pattern. I started to pull in type using letterpress, carbon paper and paint but with the paper and colours feeling a little repetitive and bland it was time for a rethink. This time, I had the assortment of interesting papers with strong shapes and ink textures that sat beautifully alongside the flat, matt colour of the paint. I wanted to experiment with these surfaces to see how the spot and stripe elements could work together without necessarily creating a repeat pattern straight away. The process and results quickly proved to feel more expressive with the occasional ‘aha!’ and subsequently became much more enjoyable and satisfying. The compositions also started to remind me of (very) abstract landscapes. This ended up being the perfect warm-up exercise for the next stage. I knew I had elements that I could extract to compose and form a repeat pattern. I decided to work on a smaller scale creating individual ‘themes’ combining spots, stripes or a combination of the two. I limited elements so as not to over complicate the designs. The more I did, the more I enjoyed it, the shrinky dink size of these worked really well as preparation for the repeats. It was interesting to observe how this felt working on such a tiny scale compared to the larger scale in the previous collage exercises. It was fiddly and intricate but the elements came together more quickly and suited this particular exercise. From this, I was then able to select combinations to make a repeat pattern. This brief has certainly been a challenge. Many, many hours have been spent researching, sourcing inspiration and ideas, scribbling, sketching, thinking, head scratching, reading and re-reading, all with a mix of both frustration and excitement. It was also a very time consuming process compared to other conventional ways of working, the actual cutting, arranging/re-arranging and glueing of paper as well as all the paper prep. Ironically though, despite the early struggles, it turned out to be a big learning and discovery curve and I really enjoyed the latter stages. I’m still not sure if I’ve fully answered the brief in all the places but looking back, I feel the work has evolved to be much bolder and stronger and I’ve definitely gained more confidence from the process. 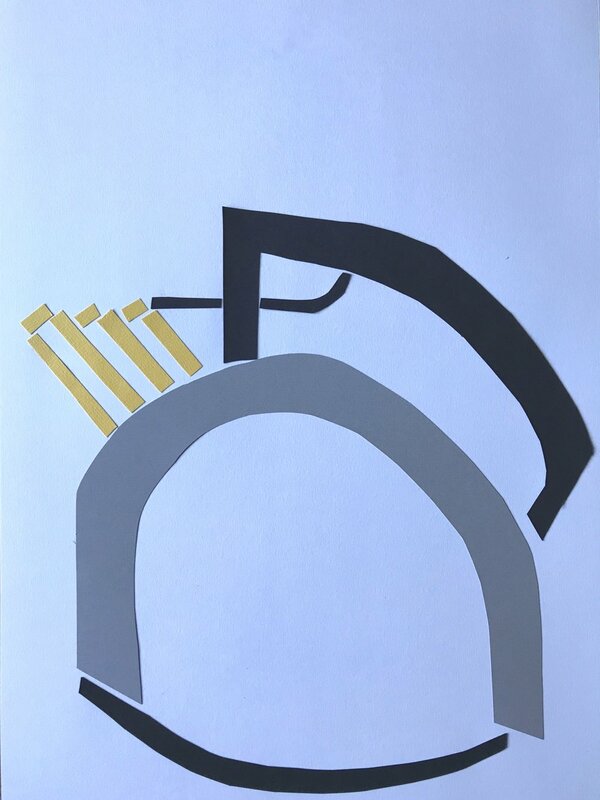 I’ve discovered new ways of working, produced a type and body of work I’ve not produced before and would love to develop and explore a few new ideas further. 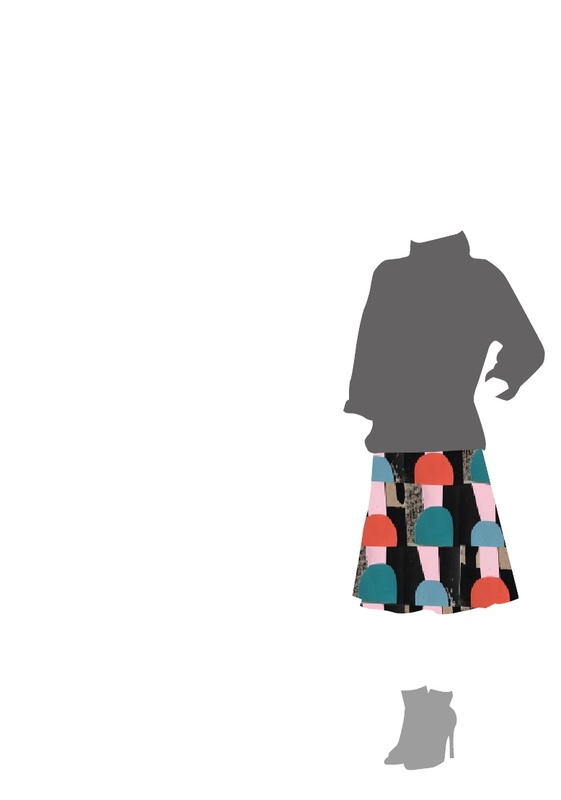 The aim of the brief is to introduce new ways of drawing, offering more expressive ways of working in textiles. The various stages encourages use of conventional and unconventional tools and media, development of observational skills as well as adopting a variety of drawing techniques and approaches. I started this exercise aware I had drawn very little over the last few years. As well as detail in the line, I was also concerned with composition and perspective. The chosen objects were more complex to draw than initially given credit for but also very interesting. 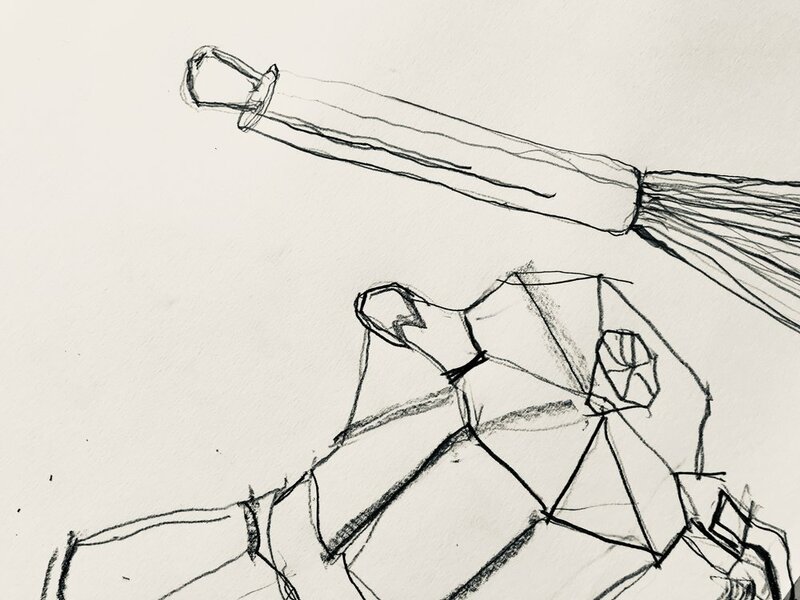 For the first right and left handed exercises, I used graphite and while it felt less fluid, my left hand gave much more interesting results. I was less hung up on perfecting composition and perspective and preferred the few added wiggles here and there; even the inconsistency in line weight and thickness was interesting. Perhaps I was just warming up after drawing with my right hand? I was genuinely pleased (and slightly surprised) with the results. I also started using pastel, something I hadn’t used in the previous mark making exercises. This was both soft and sharp as well as offering variety in line quality. Working with my left hand, I then used ink with three very skinny plant stems to draw the colander (below). I felt this worked really well, giving interesting mark quality with multiple lines and varying weights. I found as I drew more, I noticed more; subtle areas of light, dark, thick and thin and in the last two drawings felt I could make more use of the descriptive words with the stems. I’ve definitely enjoyed working with the handmade tools using my non-dominant hand. Less pressure and expectation! This exercise is exactly that, an unbroken, drawn line where the drawing implement remains in contact with the paper until the drawing is completely finished. It encourages observational skills and expression while allowing for abstract representation and interpretation. I thoroughly enjoyed the fluid, abstract approach with these exercises, while still considering detail and perspective. Pen and graphite were used as were ink and plant stems, both producing very different results. The words slow, multiple and agitated were used as reference. I actually found all the drawing tools to be fluid, the only slight hindrance was re-inking the plant stems. Change of direction and hand angle also influenced the lines with some interesting results. I definitely preferred this to the previous exercise (I) due to its looser approach; shape and line felt far more expressive. This exercise was about re-introducing mark-making without over-thinking the ‘perfect result’. Drawing is about observation and representing reality but is also very much about individual interpretation. The first exercise was about drawing ‘blind’, continually observing the object without looking down at the paper. This was really enjoyable and a refreshing approach on ‘observational’ drawing. Again, it was fluid and loose without any pre-conceptions of the outcome. I found the drawing from memory exercise produced a much more conventional drawing, something I’ve come to be less keen on. However, in terms of memorising the detail of the potato masher (as used in the drawing blind exercise), it was a constructive exercise to do. The direction of the lines and perspective of the utensil did pose some challenges despite being fairly simplistic in shape and detail. For the final exercises I enjoyed working with the fluidity that continuous line gave me. Drawing ‘blind’ again was quite liberating and I became attached to the draining spoon with its straight and curved lines. However, I felt amalgamating a few of the techniques were less successful and representative of the object, for example, left handed, ‘blind’ and continuous line didn’t produce a very good result. I also introduced two new objects, the can opener and a parmesan grater, but still went back to the draining spoon! Pen worked really well again, less so a soft graphite stick; I felt a sharper, more defined tool was more appropriate with this exercise. ‘Blind’ working encourages you to continually focus on the object, rather than constantly observing the paper and correcting if it goes wrong. My last drawing combined the mark making and line exercises, opting for negative lines with masking fluid and plant stems again. This medium was hard to draw with using the stems while trying to achieve detail in the line. Much less random (and successful) than the mark making exercise. After completing these exercises, I definitely prefer the outcomes of unconventional, looser, more abstract approaches to drawing. Look more, think less! This consisted of a series of warm-up exercises designed to ease out those overthinking muscles and engage your creative core. Making use of conventional and unconventional handmade tools, the exercises involved making marks with dots, lines, dashes and squiggles. A series of words were given to prompt the mark marking, such as soft, heavy, flowing or agitated. The medium and tools ranged from black and white ink, brushes, oil pastels, black pens and various grades of graphite to a plethora of handmade implements. My tools instinctively took on a plant theme and with Autumn well under way, I had a bounty of dried seed heads, pods and fruits as well as the end bit of my horses’ tail and some felted sheep fleece. These exercises proved to be more in-depth than first thought; not helped by the control freak in me overthinking everything! The results are not only difficult to predict but also to control, particularly when using tools that can disintegrate or break easily. Plus, mark making can be pretty random - but isn’t that the point?! So, trying not to get too hung up with the result, I plugged away and tackled the exercises. I loved the marks that the chunky graphite sticks and pencils created. They could be soft using sides, sharp using corners and edges as well as somewhere in between. The wide brush proved to be a big surprise achieving one mark that felt incredibly three dimensional. The effect reminded me of fibres (see below). Oil pastels and pens proved the most predictable with much less interesting results. Moving on to the handmade tools, there were a mix of successes. The majority offered something of interest with the dried heads of the peony, echinacea and achillea producing the most exciting results. At first, the masking fluid didn’t look overly promising as the chosen tools looked to be under performing. Or so I thought. The plant brushes triumphed again! To start with, I was more confident making tools than I was making marks. I also hadn’t used masking fluid before but overall, I was really pleased with the results. This mark making exercise also proved that cropping (through photography or other means) could transform an image into something compositionally quite striking and dramatic. For me, working through these exercises really did highlight the need to concentrate on the process rather than the end result. Generally, I found the conventional tools didn’t produce the best results compared to the seed heads as I felt they lacked variety. Peeling off masking fluid to reveal hidden, underlying marks was extremely satisfying! Influenced by the tools and given words, marks differed enormously; this ranged from shape and size to almost having an energy or movement about them. Other marks in comparison felt quite still or static. For the larger, final stage of this brief, I recreated some of the marks from earlier, opting to use the mediums of masking fluid and black ink. As well as the seedheads, I re-introduced the horse hair and felted sheep fleece. Reversing the process slightly, I used a brush for applying the masking fluid and the unconventional tools for painting on the ink. This was followed by using the same tools to paint on both the masking fluid and the ink. Results were mixed; some were more successful than others but this method is definitely one I’d like to explore more.